If you travel to Holland in the spring expecting to see mile after mile of tulips in bloom across the countryside, you could be disappointed. Not that this extravaganza won’t indeed happen every year. But given the vagaries of weather, just when they will bloom in any given year is uncertain. On average, the second half of April would be a good bet. Wait too late, and machines will be heading out to the fields to chop off the flowers. If you’re growing a bulb for sale, you want energy to go into the bulb itself, not the seeds. 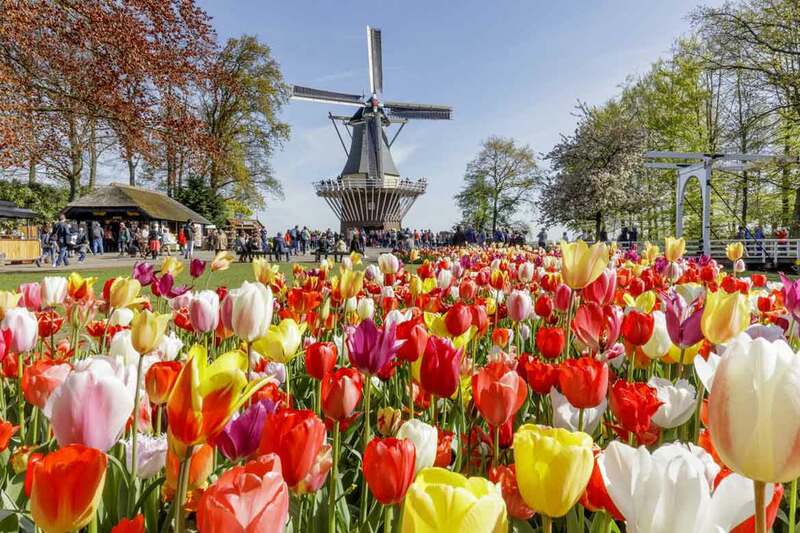 Tulip fields or not, there are many other gardening delights to discover in Holland. Keukenhof would arguably be any garden enthusiast’s first stop. 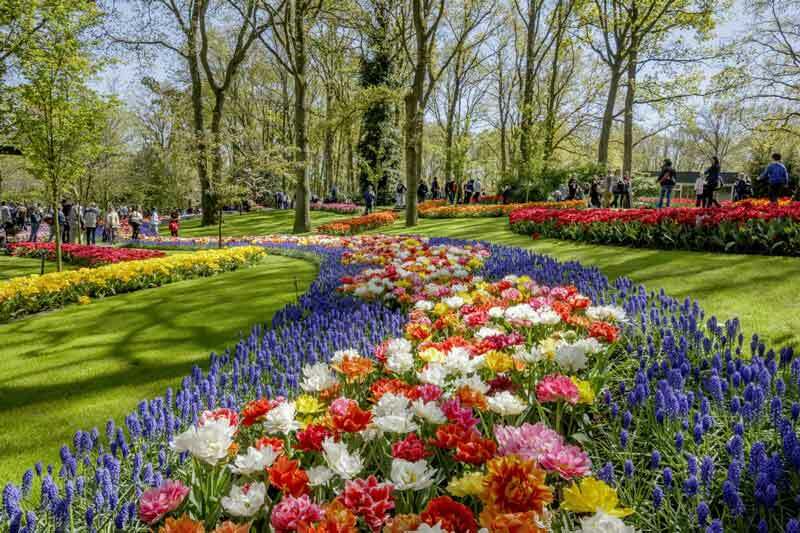 A garden that appears on many “Best Of” lists, Keukenhof lies about 25 miles southwest of Amsterdam in the town of Lisse. The official name is simply Keukenhof, meaning “kitchen garden.” The term dates to the 14th century, when the estate’s gardens provided provisions to Teylingen Castle. Keukenhof is all about bulbs. Eighty acres are planted with 7 million bulbs, 800 varieties, in the fall of every year. 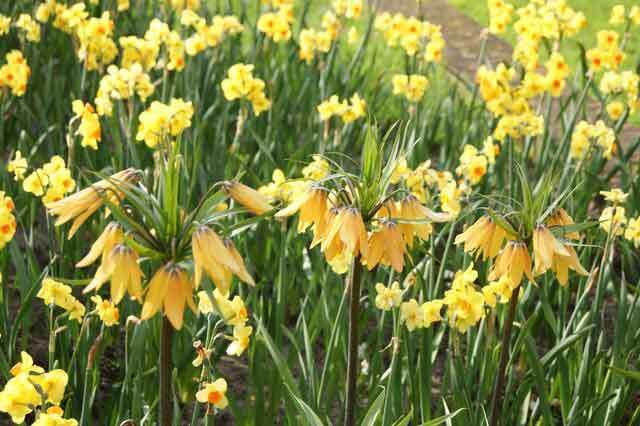 Bulbs are supplied by 100 companies working in close concert with the garden’s designers. For their efforts, the bulb suppliers may display discreet signs by the beds. It quickly becomes clear that someone—indeed, many “some ones”—has given considerable thought to the design of the plantings. Combinations of color and height are spot on: as an example, a bed of yellow daffodils is punctuated by tall orange fritillaries serving as exclamation points. Given Keukenhof’s size, the flowerbeds seem to go on and on, yet are never repetitious. One area will feature more formal rectilinear plantings; you then pass into an area of English landscape style, with ponds, berms and curvilinear shapes; a bed with primary colors is followed by the pastels. In mid-April, some tulips are likely to be out, but won’t be the predominant flower: daffodils, hyacinths and anemones will provide much of the bloom. While flowers are indeed the stars of the show, numerous trees and shrubs provide additional interest. Dutch weather can change by the minute, so if a sudden shower hits you can scurry inside to one of four pavilions. One features a permanent orchid display, another has tulip information and history, while the two other pavilions house more than a dozen rotating flower shows throughout the season. 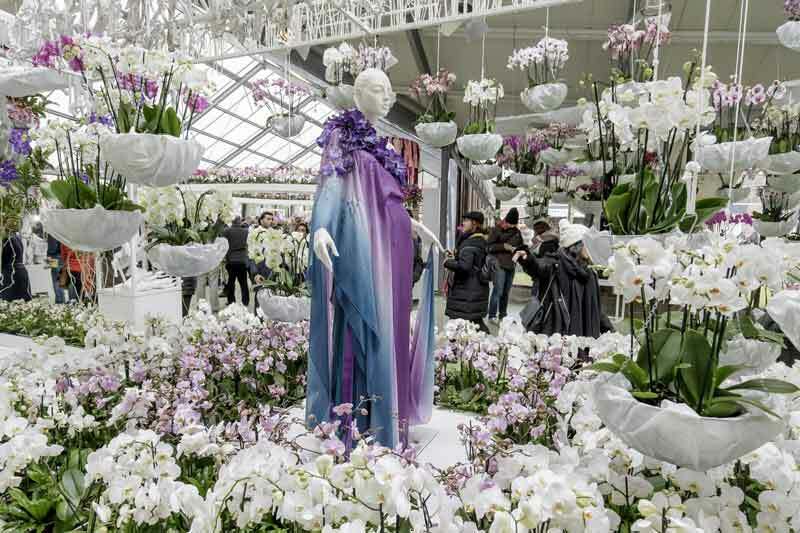 The orchid show includes imaginative displays transforming plants into fantastic costumed mannequins. Taking the prize for sheer size, the main flower show covers an area the size of a football field. The effect is mesmerizing and stunning. With shops, eating areas and benches providing a break from the floral display, one can easily spend the better part of a day at Keukenhof. If you do happen to visit The Netherlands when Keukenhof isn’t open, there are a few other gardens to visit. A short tram ride from the hustle and bustle of central Amsterdam, Hortus Botanicus Amsterdam sits in a quiet residential neighborhood. 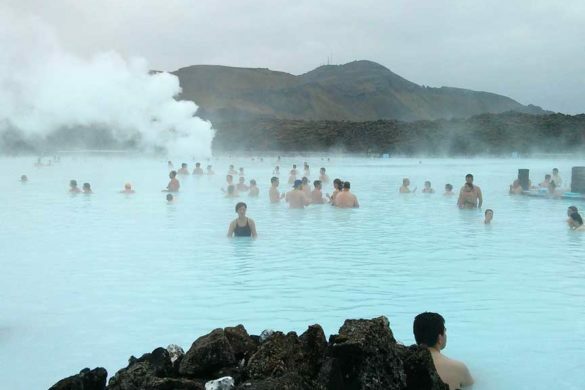 Dating from 1638, it ranks as one of the world’s oldest botanical gardens. While covering only about three acres, it’s home to more than 4,000 different kinds of plants. Like many older botanical gardens, it originated with plants that had presumed medicinal benefits, including many species discovered in the Age of Exploration. Today, Hortus Botanicus still showcases plants from all over the world. Hardy species live outside in a pleasant park-like setting, while the more tender varieties are housed in conservatories. One of the most impressive collections comprises the cycad family, primitive plants that superficially resemble palms. The oldest plant in the entire garden is an Eastern Cape giant cycad. Over three hundred years old and eight feet tall, it’s reportedly the oldest potted plant in the Western world. Admission is charged to the garden. Going a bit further afield, the Kroller-Muller Museum is near the town of Otterlo, about fifty miles east of Amsterdam. A small art museum surrounded by gardens and sculpture, it showcases the synergy between plants and art. 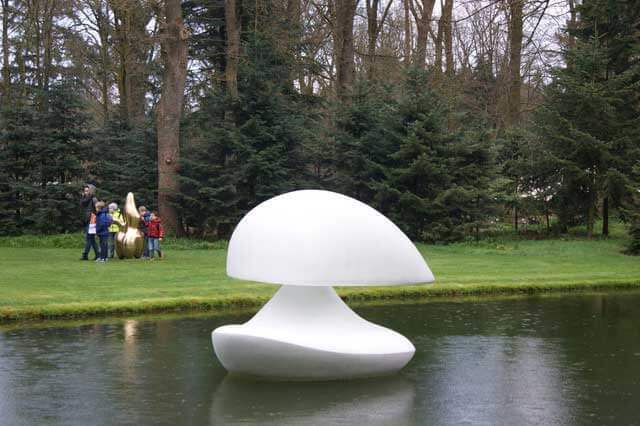 The 62-acre property is home to 160 sculptures dotted about the lawns and woods. A favorite of many visitors is a floating plastic creation resembling a cross between a ten-foot tall rubber ducky and a toadstool. The museum itself houses an impressive collection of contemporary art, including 90 paintings and 180 drawings by Van Gogh. Surrounded by De Hoge Veluwe National Park, you have to pay admission to both the Kroller-Muller and the national park as part of a package. The park sits on a hundred-foot high glacial moraine covered by oak, pine, birch and heaths, perhaps not one’s idea of a typical Dutch landscape. Some advice about buying Dutch bulbs while visiting: We were repeatedly advised not to do so. If you visit in spring, you will be buying last year’s bulbs. Wait until you get home to order, and you will get bulbs that were dug that same year. Charles Kidder gardens in Cary, North Carolina and also volunteers at the JC Raulston Arboretum in Raleigh. He is always looking for new gardens and unique botanical areas to visit.